Last year, Good Cause Gifts at the Hospital for Special Care in New Britain sold $35 worth of merchandise on Shop Small Saturday. This year, the store rang up $350 in sales, thanks to Gail Ouellette’s plan to talk up the store’s Shop Small promotion to every patron who walked in on Nov. 24. “If you are going to shop, today’s the day,” said Ouellette, who is a job coach for a person with disabilities at the store, which supports the creation of sustainable jobs for people with disabilities. Good Cause Gifts and thousands of other small businesses across the country participated in Saturday’s Shop Small promotion to highlight small businesses’ importance as the backbone of their communities. Since the Saturday-after-Thanksgiving event started in 2010, small businesses have taken in $85 billion, according to American Express, which established Shop Small Saturday. It’s always the busiest day of the year for Good Cause Gifts in Berlin, said Sharon Faucher, manager and director of retail social enterprises for both locations. The store is a division of Futures Inc., which promotes and creates jobs for people with disabilities. 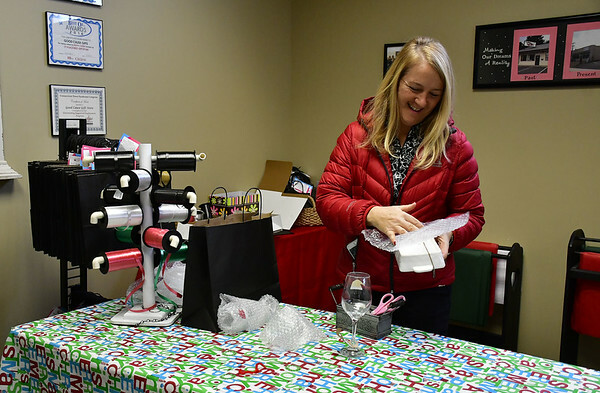 A second Good Cause Gifts was opened about two years ago at the Hospital for Special Care. Throughout the store on Main Street in Berlin, patrons were looking at women’s clothing and holiday gifts. There was a line at the register. 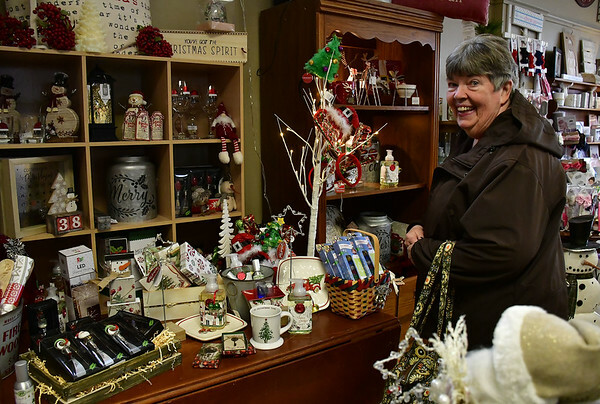 As she held a red plaid pillow with the phrase “Tis the season” embroidered across the front, Kiley Flynn, of Griswold, admitted that she comes to Good Cause every year for Shop Small Saturday. “It’s important to support small businesses in Connecticut,” she said as she juggled the pillow, which was to be a gift, a small clutch, which she was buying for herself, and a Corkcicle mug which was also to be a gift. Karen Masi said she always supports Shop Small Saturday by offering promotions at her Bristol store, it! Candy, and by shopping at other small businesses. Masi offers an array of specialty candy for those with dietary needs, from sugar-free and gluten-free confections to vegan and original treats. Like many merchants participating in Shop Small Saturday, she was offering discounts. It was a bit slow, she admitted, but she also pointed out that most people get their holiday candy about two weeks before the day, so she knew she’d she be busy within the next few weeks. “Being a small business, I try to support all the small businesses I can,” she said. Across town on Farmington Avenue, Shannon’s Diamonds & Fine Jewelry. was bustling, said owner Scott Fournier. The store not only offers a wide selection of watches, rings, necklaces, earrings and other jewelry, it does repairs and will perform appraisals. Fournier said he believes in promoting Shop Small Saturday to encourage people to shop locally. Posted in New Britain Herald, Berlin, Business, New Britain on Sunday, 25 November 2018 21:22. Updated: Sunday, 25 November 2018 21:25.